Okay! 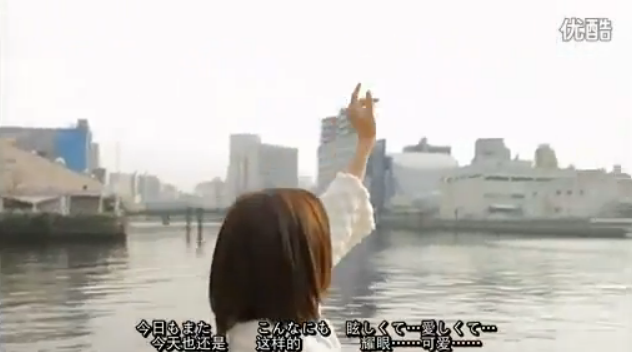 Musume Time: How They Used to Be - Mano Erina's 'Tasogare Kousaten' PV Review!!! How They Used to Be - Mano Erina's 'Tasogare Kousaten' PV Review!!! All opinions regarding this song/singer/PV are my own and no one else's, unless otherwise stated. What I think and feel does not have to reflect how you think or feel, or view the video - I just want to give my opinion. If you do not like my opinion, then simply do not read this post. If you do read, then remember that you must respect mine and everyone else's opinions. Thank you. I honestly was not expecting to see another video from Hello! Project out so soon, especially a Mano one - but, this is actually the video I have been anticipating for a while now. After Doki Doki Baby came out, and the preview for Tasogar Kousaten was released waaaay back, I wanted to see this specific PV... and then H!P, the bastards, never released it. Okay, basking over. If it was Niigaki, we would be basking even longer! Oh my! WARNING: This Hello! Project MV actually contains a storyline! Whether or not the song is for a drama, I don't know, but I repeat, there IS a storyline! ... Er, this guy looks a little too old for you, Mano. Wtf? Mano looks pretty - loving her coat too. I love the natural feeling she gives off. The Return of the ManoPiano! 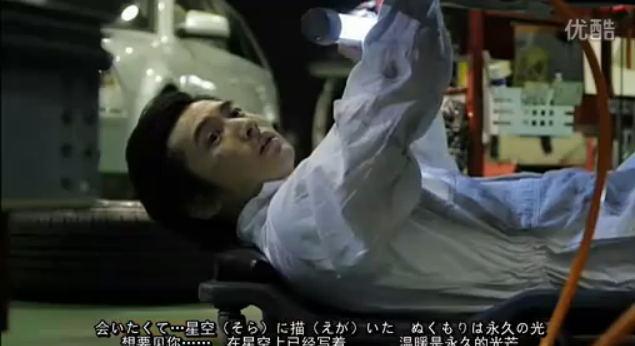 Oh, and he works with cars - probably the ones that were shown in Zassou no Uta? This riverbank scene is nice. Mano: "I will eat your soul..."
D'aww, look, little Mano in a school uniform! Yay for fetishes! So, they were childhood friends? Guy: Wanna play with ma balls? I wonder if they're skipping school? Mano's waiting for it to rain, or snow - either way, it won't. So don't get your hopes up girl. Oh look! No-Ponytail ManoEri means an older ManoEri! Yay for random hair change which instantly changes your age! And her boyfriend tries to make off with her bag! THIEF! D'awww, she has a picture of them together on her phone! How nostalgic and sweet! Crap, she's dead! 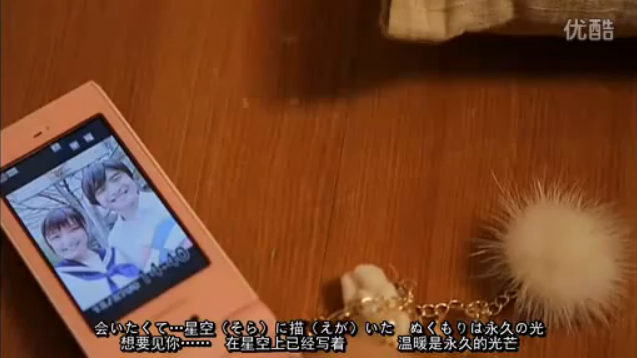 I swear, it's that Cellphone movie that Airi was in!!! Or any Japanese horror with cell phones! Oh crap, Mano, there's a car behind you! This scene gave me the chills. I thought it was really sweet, though rather predictable. If she had murdered him instead, I wouldn't have expected it. Mano confronts lover boy, and he probably explains why he has been ignoring her. 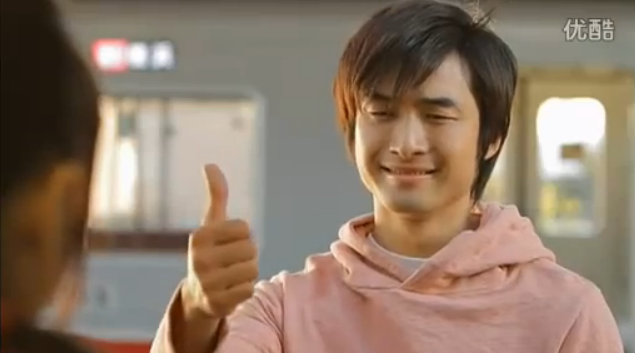 And, with that, Mano gives him her killer stare, but pretends to affectionately hug him. Guy: "What was t hat?" So, I'm really glad that this PV came out - as I said previously, this is the song that I wanted to see the video to for a while now. Whilst I liked Doki Doki Baby, I wasn't totally blown away by it. 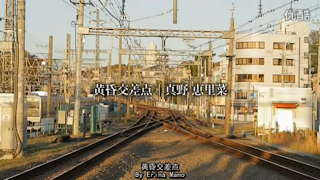 The preview I saw of this PV was quite short, so I couldn't really get an idea if this would be a music video with dialogue in it, or just a regular MV - Finally though, we get a nice, simple video that has a storyline to it that works well with the song that Mano is singing. 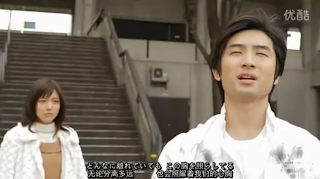 I really like this PV, for all the simplicity and sweetness that it brings. I like that it's shot outside and that it focuses on a storyline rather than ManoEri just walking, dancing or close-up shots of her creating the video. I have a feeling that this song is for a drama, and that the clips are from said drama, but it is still a really nice edit all together - ManoEri looks beautiful here, and really mature. I loved her in this song and video, because of that mature and adult-like emotion she gave off. 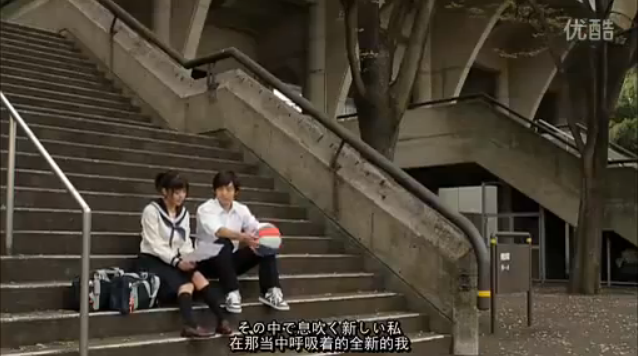 It's a totally different atmosphere to Doki Doki Baby, and shows off how grown up Mano can look and act in a video. I liked that the video focused on the past and the present of the young couple - it was a nice way to show how their relationship once was, and what it had become. Early on in their relationship, they had been close friends until ManoEri confessed, but their long-distance relationship (most likely due to school or jobs they hoped to be in) must have caused a strain in how they interacted. Whilst ManoEri seemed to be quite comfortable with how they were, it was pretty obvious that the guy didn't know what to do or even how to feel, and in the end, he became distant towards ManoEri's character. I liked the relationship that they both portrayed - it showed both their feelings well, with ManoEri trying to deal with this new man, whilst returning her to her past to show how close they had once been. In the end, I like that they become closer - the boy most likely explains what he is feeling, and ManoEri is trying to support him. This is the basic storyline that I picked up from the video, but you guys can interpret it any way you want - however, what I got from the video was a rather bitter-sweet love story about how things once were, but trying to get used to how things are now. It was a nice storyline, and I think that both actors did well in trying to get their emotions across. 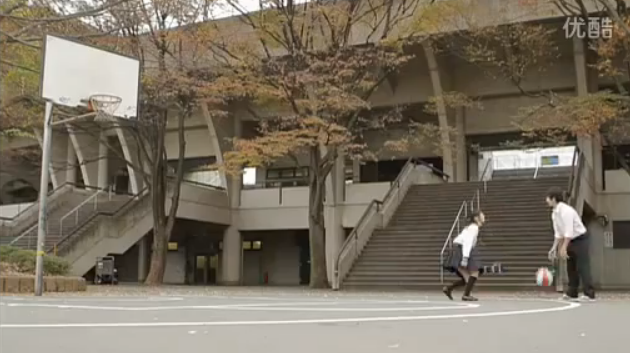 Mano looks so good in this video - her close-up shots include her walking and standing on a bridge over a river, and her standing on a street as people walk past. There really isn't much else, but her expressions and how she moves is really interesting. I am almost entranced by how Mano Eri can act on camera without even having to look at the camera to tell us her feelings. It's almost like she herself is in a daydream, singing this song. When I watched this video for the first time, I honestly felt like the Mano from the drama clips of MV was singing this song about her experiences, rather than Mano singing about a couple. I like that her acting came through with these scenes, because it made the connection for me, and didn't separate the story from the singer. Now, moving onto the music itself - I have been listening to this song for a while now, I found it about a week ago and I really enjoy it. Out of the two songs, Doki Doki Baby and Tasogare Kousaten, this one is my favourite. I enjoy ballads, which is why I adore Mano's My Days For You so much. I also love listening to Mano sing a slower and more mature song that fits her better. She sounds so good here, well she does to me at least, and I really enjoy this song. I'm glad that the song fits the PV. I'm glad that this song was a part of a double A-side, because Mano is a great singer and actress. 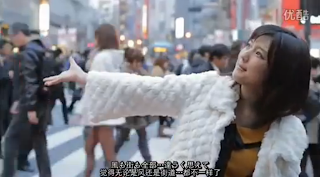 I enjoyed this video and song together, and I am glad that I anticipated it - it was worth the wait, and it just makes me like Mano even more, and it makes me want to watch any drama's or movies she is in. All in all, I think that Tasogare Kousaten is the stronger of the two PV's and songs that came out for her double A-side, and it shows off her strength as an actress and singer.